Show me my individual posts per day graph so I can show my shrink. The forum improvement worked! You should be proud. What a valuable insight into the nature of humanity, the power of instant gratification and convenience! The one bar peaks are spam days and/or possible front page flush. 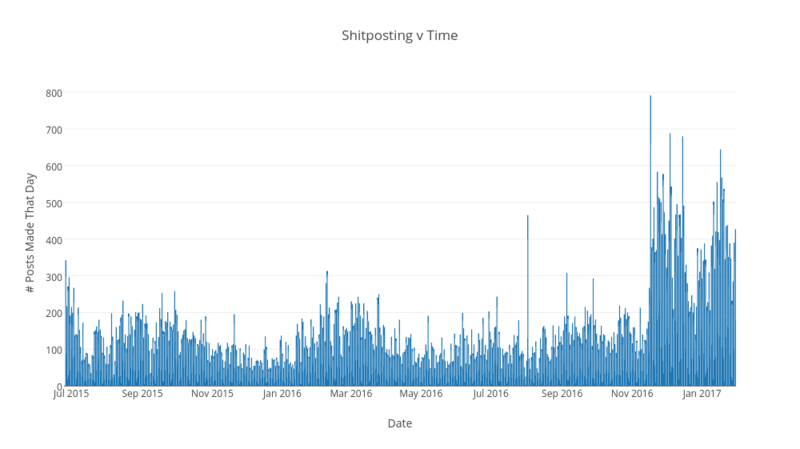 Originally posted by SCronaldo_J_Trump The one bar peaks are spam days and/or possible front page flush. I don't think so. The space between these peaks are identical across the entire graph. Well, when Totse went down for good, there was a change in the US government's administration. When zoklet went down for good, there was a change in the US government's administration. Now we're getting a surge upon the Republican feds winning the Whitehouse. Originally posted by -SpectraL Well, when Totse went down for good, there was a change in the US government's administration. When zoklet went down for good, there was a change in the US government's administration. Now we're getting a surge upon the Republican feds winning the Whitehouse. Originally posted by benny vader not true. Yes, it is true, benny. I started posting again around that time. Originally posted by -SpectraL Yes, it is true, benny. Nope. Still Obama Century then. Originally posted by HampTheToker I started posting again around that time. Clearly you joined on that high spike of 792 posts, looks like December 3rd or so. The chatter and hub-bub of the community absolutely took over when we learned you had returned. It was like a.. a bustling airport in here. Originally posted by benny vader Nope. Still Obama Century then. True, but still close enough to the end of his presidency to justify the theory. Zoklet closed at the end of 2014, with only 24 months left in his second term. Originally posted by -SpectraL True, but still close enough to the end of his presidency to justify the theory. Zoklet closed at the end of 2014, with only 24 months left in his second term. The how far should be considered far ? -Specs, you are old. You should value every minute. Originally posted by Clutch What happened in august? Originally posted by SCronaldo_J_Trump I don't think so. The space between these peaks are identical across the entire graph. Originally posted by benny vader The how far should be considered far ? Hard to say, but the Obama administration would be sure to at least have started getting things wrapped up at that point. The rats would already have been starting to look at other employment options.